A wealth of walks and walking await visitors to Dorset. From short strolls to long range treks, Dorset offers everything from coastal cliffs to inland heaths and downs. From riverside ambles to woodland trails and ridgeway rambles this amazingly diverse county and its countryside has the lot. True, if mountains and “Munro Bagging” is your thing you’ll not find either down here in the balmy south, but then you’ll not find the Jurassic Coast up North either! 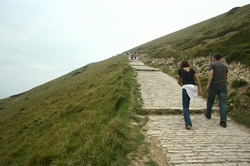 Coastal walking is what many visitors to Dorset come for. Even before the Jurassic Coast got its UN World Heritage status, the beauty and importance of Dorset’s coast was recognised by its inclusion in the South West Coast Path. Depending on your perspective, the South West Coast Path starts or ends at Poole Harbour, an amazing natural inlet with Brownsea Island at its heart. From Poole, the South West Coast Path wends its way westwards along the full 95 miles of the Dorset and East Devon Jurassic Coast and then on to Minehead via the rest of the wet side of the South West Peninsula - offering in total some 630 miles of great walking. So you are unlikely to complete it or tire of it in a day or two! The wondrous Dorset section of the South West Coast Path not only takes in some uniquely beautiful coastline, but it also offers links which feed into a variety of national, regional and local inland walks. These include the South West Coast Path’s “Inland Route”, now known as the “South Dorset Ridgeway”. This branches away from the coast at Osmington and rejoins the main South West Coast Path at West Bexington. The Coast Path also joins with, and forms part of, the “Monarch’s Way”. This route links to the Coast Path at Charmouth and West Bay. Other routes in Dorset are the “Wessex Ridgeway”, the “Jubilee Trail”, “Wareham Forest Way”, “Purbeck Way” and the “MacMillan Way”. The latter heads inland from Abbotsbury. On top of these main walks there are also amazing walks on the Lulworth Ranges around Tyneham (when Open) as well as the “Lawrence of Arabia Walking Trail” around Moreton and Clouds Hill. And then there is the “Hardy Way” from Bockhampton and Stinsford. And if this feast of trails is not enough, there is a host of other walks to be had using the rich network of public footpaths Dorset has to offer. The vast majority of Dorset’s coastal walking is covered conveniently in two Ordnance Survey “Explorer” series maps. OL15 “Purbeck & South Dorset” covers Poole and Swanage through to Bridport and map number 116 “Lyme Regis & Bridport” follows through from Bridport to just West of Seaton. For the more “Northern” parts of Dorset, including Blandford Forum,Sturminster Newton and Shaftesbury, you’ll also need maps 117 and 118. In a world of sat navs, smart phones, handheld gps and geocaching, maps like these are still a smart investment. Not only do they not need batteries, but you can also see at a glance what lies beyond your immediate environs and route. And isn’t that the attraction of walking anyway? To get away from the day to day necessity of getting from A to B by the shortest possible route and to explore? Hard to do with a machine that simply tells you where you are, where you’re going and exactly how to get there. That’s one of the great things about walking in Dorset. There are so many beautiful paths and places to discover and explore. Some may be well-frequented and so often photographed that when you visit them first for yourself, you may feel like you already know them. But for every iconic image of Dorset, like Durdle Door, the Cob and Gold Hill, there are thousands of other views, villages and quiet places just waiting for you to find all on your own. There are paths, well-trodden and less so, all around Dorset. We’ll try and give you a taste of some of them here and of what you might see should you choose to walk them. But the best way of discovering the great and beautiful walks that Dorset has to offer, is simply to get out there and walk some of them for yourself. You won’t be disappointed if you do and your heart and soul will both be better for it! From short strolls to long range treks, Dorset offers everything from coastal cliffs to inland heaths and downs. From riverside ambles to woodland trails and ridgeway rambles this amazingly diverse county and its countryside has the lot......​"